iSpring Story Contest Has Officially Started! Dear iSpringer, your success story can inspire thousands of e-Learning developers all over the world. Tell about your experience with iSpring tools and share it on your social media page, blog or website. Submit it to the contest, and win a valuable prize. Hungry for details? Then read this article to learn about the contest rules. What makes your story so valuable for us and other readers? The fact that it’s based on your unique experience! You can tell about your e-Learning projects and the tasks you’ve accomplished with iSpring tools. Any presentation tips and tricks are certainly welcome too. It will also be great if you add images, demos and other visual materials. In order to host and share your materials online, you can try iSpring Cloud, which is free for thirty days. These case studies from other iSpringers may help you get inspired and started. Overall, the more concrete data you include in your story, the better! For example, if you have numbers that demonstrate the effectiveness of your courses, include them too. contain a title, and the author’s name and surname at the beginning and the end of the story. If your story meets the above criteria, feel free to go on and apply for the contest. This can be your personal website or blog, your company’s website or blog, or any other e-Learning/training website. You can publish your story on several resources, and we will select the one which gets the most shares. You can also post a story on both social networks. We will then select the story with the highest number of reposts when summarizing the results of the contest. Stories shared on social media. We will regularly update the leaderboard on business days by 10:00 am EST. You can keep yourself informed about the current standings here. Here is the list of prizes for winners in two different categories. A one-year subscription to the character collection, e-Learning templates, and Stock Asset Library. Value of $948. 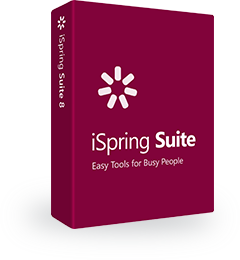 Technical support and free minor and major upgrades for your iSpring tool. The best service for sharing iSpring content. A promo code which allows you to purchase any goods in the amount of $100 at Amazon. One-year subscription to eLearning Brothers Cutout People Library. Value of $348. Just some more information that may help answer your question. Contestants must either be using an official iSpring program(s) (either licensed or a trial version), or must have worked with the iSpring program(s) in the past. The Contest is open only to legal residents worldwide who are 18 years old as of the date of entry and who have a valid email address. Employees of iSpring Solutions, Inc. (“Company“ or “iSpring”), its affiliates, subsidiaries, advertising and promotion agencies, and suppliers, (collectively the “Employees”), and immediate family members and/or those living in the same household of Employees are not eligible to participate in the Contest. The Contest is subject to all applicable federal, state, and local laws and regulations. Yes, you can. You can submit different stories within one category or for both categories. To do that, submit different stories with the same email address. What if I win in both categories? If there is one and the same Winner in both groups, a Winner may select one prize from any of the groups of prizes (only one prize is awarded to a Winner). What if I provide the wrong information by mistake? If you have sent a request by mistake or provided a wrong link, you can contact us at contest@ispringsolutions.com. What if two winners have the same number of votes? If two Winners get the same number of votes, both of them will be awarded prizes. Winners will be determined within five business days after the contest’s end date (September 1st) and will be notified by email provided while submitting the entry. We will also publish the results on the iSpring blog and social media. To submit your story, fill out the application form on this page. Still have a question? Write us at contest@ispringsolutions.com, or simply leave a comment below!